More than a couple of weeks have gone by since BOC policymaker Wilkins dropped a hawkish bombshell on the markets by signaling that it may be time for them to consider hiking interest rates. By the looks of it, the Loonie is still getting a boost from this shift in policy bias, especially since it was supported by mostly upbeat Canadian data. To top it off, BOC head honcho Poloz himself acknowledged recent improvements and another policymaker mentioned that Canada has been able to move on from the oil price slump. On the daily time frame, it can be seen that CAD/JPY is ready to complete its inverse head and shoulders pattern, which is a classic reversal signal from a previous selloff. What’s particularly interesting about this pair is the divergence in monetary policy biases between the BOC and the BOJ. As Forex Gump summarized in his central bank roundup, the Japanese central bank is trailing behind most of its peers in maintaining a dovish stance and hesitating to reduce stimulus. Rising U.S. bond yields aren’t doing the lower-yielding yen any favors either. Apart from that, resurfacing tensions after North Korea’s latest nuclear missile test launch has also dampened demand for the Asian currency. After all, the missile landed in the sea near Japan’s Exclusive Economic Zone so it runs the risk of actually landing inside the country later on. 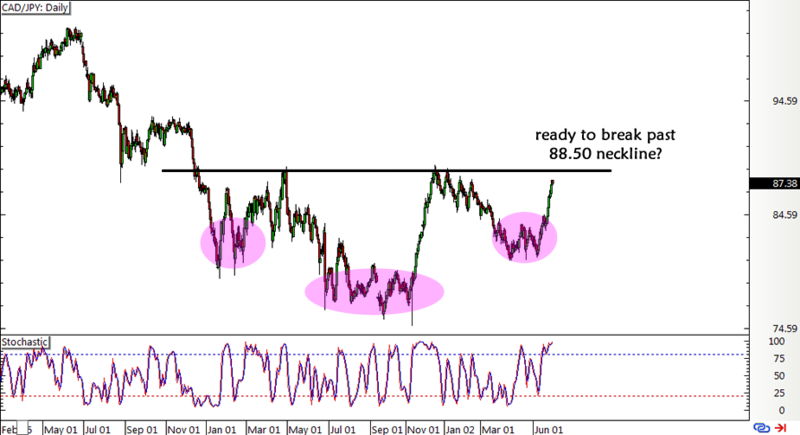 I haven’t set any actual entry orders just yet but I’m looking to go long on a break past the pattern’s neckline and initially aiming for the next long-term area of interest near 93.00. What do you guys think?